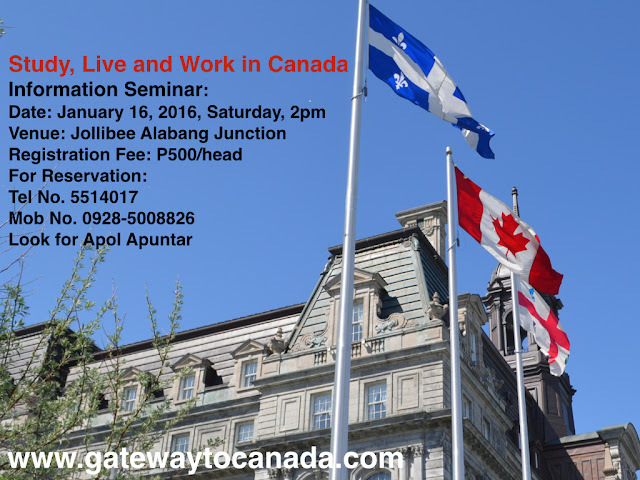 Study, Live and Work in Canada Information Seminar - Jollibee Alabang Junction, January 16, 2016 - Gateway to Canada | Canada Immigration Consultancy! Start the year right. Attend our Study, Live and Work in Canada Information Seminar this coming January 16, 2016 to be held at Jollibee Alabang Junction. Registration Fee is P500/head. Seminar starts at 2pm and will last about 2 hours including the one-on-one assessment. Attending the seminar will equip you with information about different pathways to live and work in Canada legally. The seminar venue is just beside the Canadian Immigration Consultancy Alabang Branch Office. For directions on how to got to Alabang Branch, check out Google Maps: Canadian Immigration Consultancy Alabang.